Henderson supplies baked goodies to most local pot shops. Deanna Henderson baked for her husband Duane. She made a dozen or so medical marijuana cookies for the retired wedding photographer and juggled her career at Itron, Inc. In 2013, the company downsized and Henderson lost her job. "I was a corporate executive for 26 years," she says. "I didn't know what I wanted to do. So I decided: 'Let's do this.'" Henderson sold her first oatmeal raisin marijuana cookies to the Sativa Sisters recreational dispensary on Nov. 1. By December, Henderson and her husband had sold more than 20,000 cookies. "We don't have time to bake for ourselves anymore," she says, laughing. "We work seven days a week for 12-to-15-hour days." The couple now has one other employee and operates out of a 3,700-square-foot commercial kitchen. Their cookies are in 36 recreational dispensaries across the state — including all but one Spokane shop — and one or two new locations are added each week. The couple now has their sights set on Oregon, where recreational marijuana was made legal by Measure 91, effective this July 1. "It has been a bit of a learning curve. We've thrown away hundreds of cookies that just didn't turn out," Henderson says. "It's very different from making cookies out of your own oven." 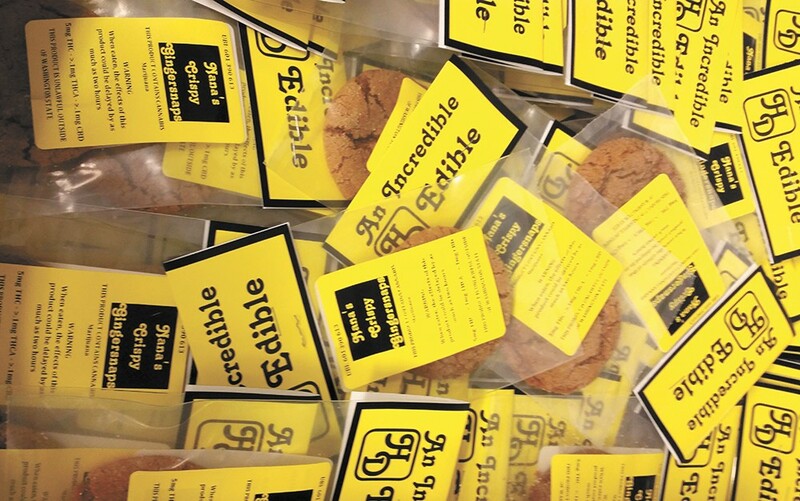 Their line of cookies, dubbed the Incredible Edibles, includes chocolate chip, gingersnap, oatmeal raisin and peanut butter. "There is a lot of real fancy stuff out there, but we just make simple cookies," she says. "We use old family recipes that can be traced back to great-grandmas." Grandma's recipes are diversifying. Last week, Henderson Distribution Bakery released the Kronic HD Tonic — a vegan, gluten-free tincture infused with local cannabis from BBB Farms. The tincture can be added to beverages and is available in sativa- and indica-dominant varieties. The bakery is also developing a topical tincture which will be released later this year.